March 29, 2011 – Can you help by providing an “expert” on TMI melted fuel removal techniques? Another item for industry. Can you help by providing an “expert” on TMI melted fuel removal techniques to consult with the Japanese task team addressing the subject? 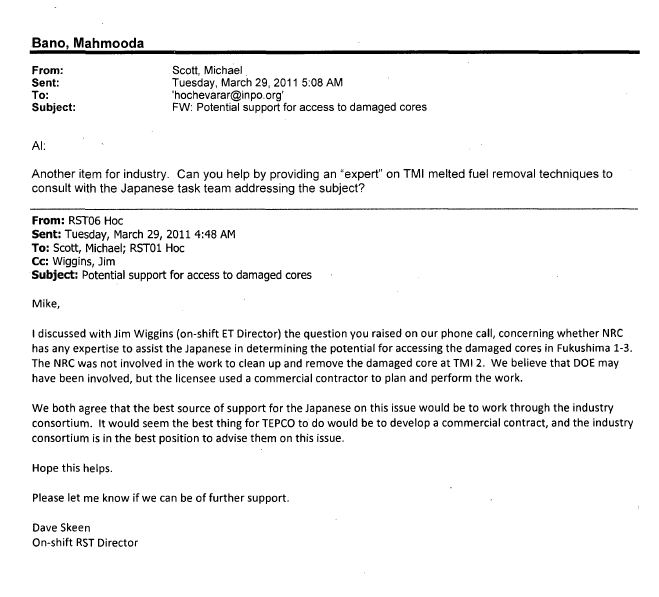 I discussed with Jim Wiggins (on-shift ET Director) the question you raised on our phone call, concerning whether NRC has any expertise to assist the Japanese in determining the potential for accessing the damaged cores in Fukushima 1-3. The NRC was not involved in the work to clean up and remove the damaged core at TMI 2. We believe that DOE may have been involved, but the licensee used a commercial contractor to plan and perform the work. We both agree that the best source of support for the Japanese on this issue would be to work through the industry consortium. It would seem the best thing for TEPCO to do would be to develop a commercial contract, and the industry consortium is in the best position to advise them on this issue. Please let me know if we can be of further support. March 15th, 2011 – Fukushima event sequences may be 2-40-13 or 2-40-18 in seismic bin-3 SBO event tree.